Some of the links below are affiliate links. Thank you for using these to support Southern & Style at no additional cost to you! Can we all just take a minute to agree that men are the hardest people to buy gifts for?! But on the other hand; when you do manage to pull off a really great gift that they love, you feel like a winner because they are truly a challenge. 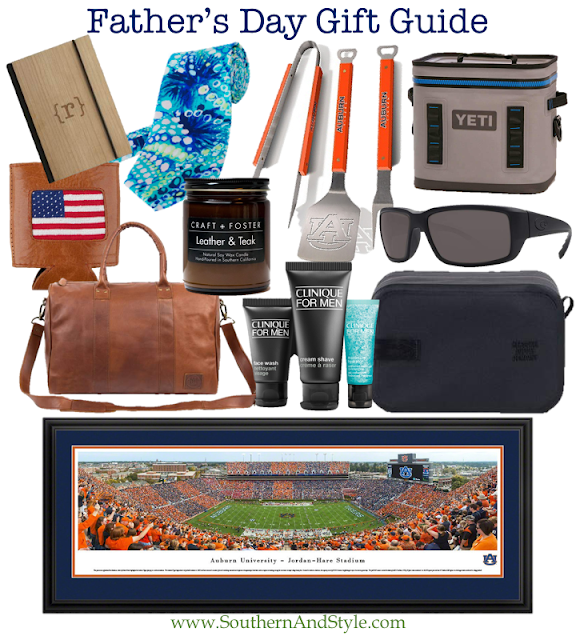 I've rounded up a ton of great gifts today for the men in your life, whether by blood or just the father figures out there-June 17th is the day to show them just a little bit of appreciation. If you want to step up your gift giving just a little; the dopp kit I linked is a great, high quality piece without breaking the bank. I would pair it with the Clinique for Men gift set so he'll be set for his next trip. The tie is also a beautiful piece for the sharp-dressed dad's out there! And of course, for the bigger splurge pieces (still less than $150! ); I love the collegiate stadium prints (they come in 47 different teams! ), the Yeti Hopper cooler-we own several different Yeti's and they're great quality...this is a great beach sized cooler in my opinion, and of course that beautiful leather overnight bag-if your dad is a quality kind of guy, he'll appreciate this nice piece. 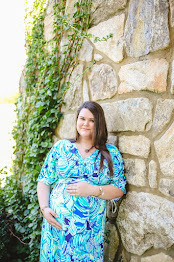 I also included the sunglasses because they're favorites of both my husband & my Daddy! Please remember that Father's Day & any other holiday, they really aren't about the gift-they're about showing love to those that are important to you. A sweet note in a card or just spending time with the important men in your life is more than enough. Other great gift options would be concert tickets or tickets to a sporting event for a team that your dad enjoys; I also think it would be so much fun to take your dad to a cooking class if he enjoys cooking, or perhaps a book signing if his favorite author is coming close to your town. Let me know below what you're planning on gifting (or doing for/with) your dad this Father's Day below! My dad was always so hard to shop for, it was almost impossible to try and figure out what to get him. These are some great suggestions. Luckily, my husband is a lot easier to shop for than my dad was. SO funny story I panicked a couple days ago and thought Father's Day was THIS weekend so I rush shipped a gift to my dad- lol!! :) These are great gift ideas though, I'll have to remember them for next year or his birthday! I love these ideas for Father’s Day! These are all such great suggestions for Father's Day gifts! My dad loves sunglasses he has several pairs! honestly, some times i wish my dad was more materialistic so i can get him something for father's day xD but these look like some good products!!! I always get my FIL a craft beer club subscription! They've retired now and don't really want "things" so I like to get him more of an experience... that's delivered right to his door! YETI coolers are our FAVORITE. I love how sturdy they are. SO many great Father's Day picks! My dad always loves getting grilling supplies to use. I HATE buying for men, it honestly just stresses me out. I love the mens skincare idea, I feel like my Dad could use that but totally wouldn't buy it for himself. My dad is SO hard to shop for and his birthday and father's day are a week apart. Food or beer is always a safe bet with him though! Great picks! I think my dad would love to get that cooler! Great gift ideas-- I still need to get my dad a gift so these are SO helpful! So many awesome ideas! I can't believe that Father's Day is right around the corner. I need to buy something for my dad, so this post will come in handy when I figure out what to get. What awesome Father's Day gift ideas! I need to place my order asap!